You are here: Home / FAQs / Isn’t proofreading on an iPad less accurate than on paper? Some folks passionately believe proofreading on a screen is less accurate than proofreading on paper. We respect those folks as fellow professionals, and we want to state up front this FAQ post is NOT intended to start some kind of argument or lengthy debate. There is some truth to the belief that paper is mightier than the screen … but we’ve determined that the “truth” currently floating around cannot be applied to ALL screens — that is, all screens are not created equal. We’ve done thorough research on this debate. First and foremost, we found that there have been no studies done on screens vs. paper since 2006 — yet the iPad was first released in April of 2010 (and has been since greatly improved upon in just a short time). In addition, a grand total of zero studies have been done between an iPad and paper. Furthermore, no official, objective studies have been done between any type of screen and paper with transcript proofreading as the task at hand. The Garland article compares all studies that have been done on paper vs. screen over the last four decades. You’ll note that the later the study, the fewer significant differences were found in terms of reading speed and accuracy between paper and screen reading, if any were found at all. We feel the evidence is undeniable that these older studies, while arguably true at one point, are unable to provide a clear picture for today’s technology. RELATED: How I Proofread Transcripts "So Fast"
The findings from the studies, however, continue to be cited as truth despite evidence to the contrary. What was true about technology in the ’70s, ’80s, ’90s, and even into the 2000s and beyond isn’t necessarily true in 2015 — and it can’t be, logically, because the technology that existed in the time periods the studies were performed (especially the older studies) isn’t even manufactured anymore. Therefore, we don’t believe grouping all screens together into one category is fair — screens have come a long way since the studies were done. Do you remember using computers from the ’80s, ’90s, and the 2000s? The monitor displays were grainy, pixelated, and they were no comparison to the crystal-clear, paper-like display of modern tablets such as the iPad. For us here at PA, we believe the iPad’s ultra-clear retina display trumps the screens of older computer monitors that were the subjects in many of the past studies. Moreover, for those who’ve used an iPad specifically to proofread transcripts, it’s hard to deny the oomph an iPad adds to our proofreading: an instant dictionary and Google look-up tools; automatic backlighting adjustments on an ultra-clear retina display (easy on the eyes); and our favorite — the document search tool, which makes it fast and easy to check for all additional instances of a misspelled name, number, or word. 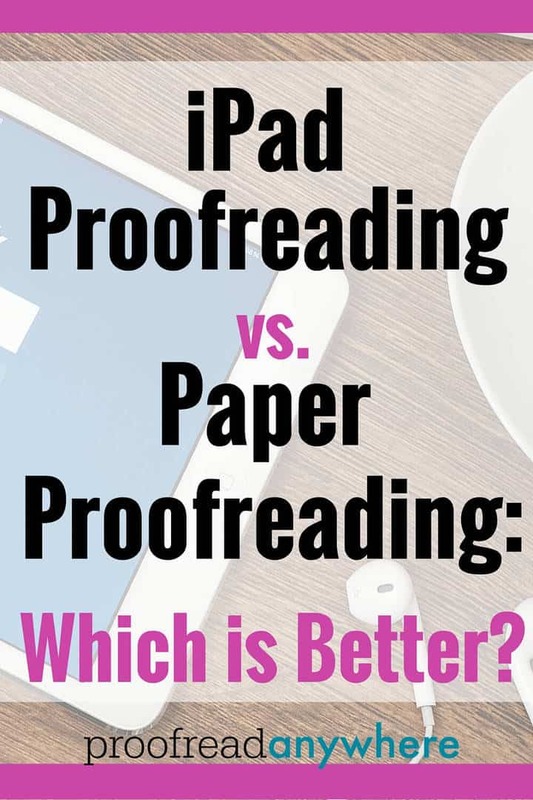 We believe iPad has the potential to make proofreading even more thorough — especially if you fully utilize the available tools. If you’re concerned about the effects of light emitted from iPad screens, even from the sleek retina screen, we recommend purchasing blue-light filtering computer reading glasses or these nifty screen films for iPad. RELATED: [FAQ] How Do You Manage Your Workload and Your Clients? Does your company have some kind of sales agreement with iPad? I’m living on a very limited income and can’t afford a new electronic product. I am not particularly computer savvy. Can I get assistance with any questions I might have? No, no agreement 🙂 The app is what we love, not the iPad itself. You *can* do this work on paper, but you’d still need to learn how to scan the pages and use email to send the file back. There are a few other apps you can use on a PC, but I really can’t recommend them to be as good as the iPad + iAnnotate combo. HI Caitlyn, have you seen that Branchfire now has an Android version of IAnnotate. This may give your students more options for a proofreading tablet as many Android tablets are much less expensive. I’ve heard it’s been revamped, but I’m just not clear if it includes all the features that the iOS version does… namely, stamps!! 🙂 If you find out, let me know. You can try a refurbished one too or shop “open box” at best buy. Maybe set some money aside little at a time? gazelle has a few for under $200. Saving might take awhile but it might be worth it! I hope that info helps! Caitlin & Team, I saw elsewhere on the site that you prefer the iPad mini (8″) to the larger 10″ or 12″ models. I was surprised, and then I realized how convenient the smaller size must be for carrying around and holding in your hand (especially for long periods of time). I’m curious; have you used iAnnotate to proofread on the iPhone 6 Plus? I have not. iAnnotate does not yet exist for iPhones, though!! I hear they’re going to release it soon, but honestly I think even the 6 Plus’s screen is too small. I am interested in learning more. Have searched the site for the price for the training, but have not found it. What is the fee for training, and what computer equipment, etc., is required? And the 1-2 hour a day introduction work period might be a problem; is that an estimate? Sorry for so many questions. I just got my iPad, and now I just have one question; iannotate or iannotate 4? iAnnotate 4 is the latest version, and Branchfire will be phasing out iAnnotate. That being said, they are still working out the kinks of the new program, and a lot of people are sticking with the old version for now while the new app is going through the debugging phase. But eventually, you’ll need to upgrade. Is it possible to try the Free 7 day intro course before investing in an iPad? I would be using either my desktop or laptop. You don’t need an iPad until Next Steps, Modules 3 through 5. And strictly speaking, you don’t need an iPad at all, but it’s highly recommended. You can read why Caitlin recommends an iPad and what alternatives are available here: Why iPad? I have an iPad 2. While an iPad Pro with its larger display, Retina technology, and greater processing power would ultimately be the way to go, do you believe an iPad 2 is sufficient for proofreading as taught by PA?